In a recent thread on one of my facebook groups a parent asked about limit setting, and the model that I use came up (though only a tiny portion of it will be illustrated here…it’s a whole book’s worth). I asked her permission to share her examples here (they’re such good ones), so that I might illustrate some of the basic principles of limit setting with young children. For background, this mom has two children: a son who is currently 3, and a daughter who is six months old. Today, just the first example: Grabbing Dad’s Sunburned Neck. Before i begin, let me say that 99.9% of requests for help with limit setting, and almost all of my consulting work, consists of families with 3 year olds and a baby. It’s a very challenging combination, both developmentally, and for so many other reasons. So keep that context in mind. Context is critical. Cardinal rule #1: Limits with words only almost NEVER work with young children. Limits need to be accompanied by physical actions. Every time. Even the first time/reminder. Cardinal rule #3: There should never be more than couple of requests to stop a behavior before a logical consequence goes into place. The consequence does NOT have to be punitive–it is far better if it is not. Natural and logical consequences are your friends. Cardinal rule #4: It is exponentially more effective to prevent a behavior than it is to respond to it. If you can block or otherwise make the behavior impossible to complete while setting a firm limit, you will be phenomenally more likely to make the limit stick. So here’s what that scenario would look like. First off, if you have any other signs that he’s feeling disconnection or needing attention, meet that need, as it PREVENTS the behavior, rather than responding to it. Same goes for him being tired–when they’re tired, their impulse control is very weak, and that’s not their fault, it can’t be treated as if it is intentional “misbehavior.”The same goes for the presence of a new or recently newly mobile sibling. He is feeling jealous, like his world is turned upside down by this new person and he wants more attention. Meet that need as soon as you see it, and you will prevent the behavior. Remember: Every behavior (yes, every one) is about getting a need met. Meet that need, and the behavior will go away. But presuming it happens anyway….let’s walk through it. The 3-year-old grabs the back of dad’s neck. 1) the adult gets up and moves to a place where the child can no longer grab them saying “I’m going to get up and move because I can’t let you hurt me.” Problem solved. 2) the child’s request for attention is met in another positive way by either mom or dad saying “Would you like to help me with dinner?” or offering a “closed choice”, like “In 10 minutes, it will be time for lunch. Would you like to play with legos or would you like to draw until it’s time for lunch?” The child moves on to that activity/connection. Problem solved. 3) wait and see if he got the message and whether he does it again. This is the riskiest of the options, and the one most parents choose. So….he grabs the neck again. Repeat the limit, again firmly holding hands, and this time explain the consequence. “I can’t let you grab my neck. It hurts. If it’s too hard for you to stop, I will need to move away from you.” And again, you have the same three options as above, with the third one being the riskiest. The third choice (waiting to see if he does it again) also puts the onus on the child to fix the behavior rather than us, which is part of the problem–the child has already made it clear that they feel out of control, and we’re asking THEM to fix that, to magically pull up some control that it’s clear they don’t have, rather than the adults taking responsibility for taking control of the situation. It doesn’t quite make sense. But let’s assume you chose #3…wait and see if he “got the point” and somehow is able to harness self-control and stop himself from doing it again. At this point (3rd grab), there are no choices left. The only choice left is #1. Hold his hands, say firmly but calmly, “I can’t let you grab my neck. You’re showing me that it’s too hard for you to stop right now, so I’m going to get up and go into the kitchen (or wherever)” And then get up and move away. The behavior is stopped by your removing yourself from the equation. Wait. Why should I have to get up and move? It’s him that’s misbehaving. Why shouldn’t he go to his room or have to sit in time out? I’ll tell you why. Because you’re the parent. Because you’re the adult. Because you have maturity and cognitive development and emotional regulation far beyond anything that your child has access to. Because your investment is in relationship, not in punishing. Because you’re “the bigger man.” Because some day, when your child is faced with someone hurting them, you want them to confidently walk away. Because the goal here is to prevent the problematic behavior. Because it shows your child that if someone does something to you that you don’t like, you can empower yourself to remove yourself from that situation–you don’t have to stay put, endure it, and beg (or threaten) the other person to get them stop. So many reasons. Because this isn’t about you. It’s about your child and what he is learning. Whoops. Back to the example. Always three chances? No. If this type of behavior is frequent, then forget the three choices, and go down to two. One reminder with stated consequence, and then consequence. Or if the behavior is repeating over and over again on a daily basis, there are no chances at all…you go right to step #1 (creating conditions so the behavior can’t continue) immediately, no reminders. Yes. I know the next question: What if he follows you into the other room, pinching your leg or hitting at you, angry because you set a firm limit and got up and left? Same thing. Again. Maybe with fewer chances. Maybe you will need to examine whether you house is set up in such a way that it could be impossible for your child to follow you (i.e. gates on some doors, doors that close, etc.). Yes. Exhausting. I know. It’s a lot of work, respectful limit setting. But only for a while. If you are firm and consistent and you follow the same set of steps without getting emotionally upset, the behavior will lessen, the limit-testing will decrease. It works. I promise. It doesn’t work as fast as more punitive methods, but that sort of “working” is an illusion–the behavior stops, but the relationship and trust are weakened, which in the long run leads to far more behavior problems. The relationship is the thing. Always. That’s why you’re doing this the hard way. To build a relationship of mutual respect and trust that will serve you well throughout your child’s lifetime. To model, and by modeling, teach self-control, which may not come completely or years to come, because it is developmental and maturational. To show your child that you are calm and confident in your leadership, which makes children feel more secure, which leads to fewer problem behaviors. That’s what you want for your kids; to do the right thing because it’s the right thing to do, not because they are afraid of punishment. That’s what self-control is: making the right decisions. This is what you want in the long run. It starts here, with respectful parenting and limit setting. These skills don’t come easy. For our children, or for any of us. Few of us were raised like this. But it’s worth it. It works. And when I say works, I mean WORKS. For a lifetime. No, it’s not permissive. Permissive is letting them do whatever they want. Permissive is giving up after a few tries…thereby letting them do whatever they want. This is not permissive. It’s responsive. And proactive. And firm. And respectful. Big difference. Keep it simple. Keep your words few and direct and confident. Be calm. Take responsibility for stopping behavior when your child has made it clear that he can’t. No more than two or three chances. Ever. Show your child that you are in control, that you have all the self-control that you could ever wish to pass along to them. Model the gentleness and empathy that you are wanting them to demonstrate. Remember: It’s not what we say. 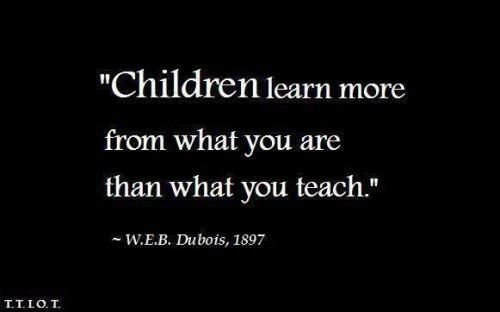 It’s who we are with our children that teaches. You can do it. You will be glad you did. I promise. Reblogged this on My Bliss Bubble.